Conductor Murry Sidlin with a full chorus and orchestra at Terezin for a memorial performance of the Requiem in 2006. One of the most active figures in the camp’s fabled musical life was the conductor and pianist Rafael Schaechter, who persuaded his beleaguered fellow inmates, their minds dulled by hunger and forced labor, to gather at night in a dank barracks cellar to rehearse, of all scores, Verdi’s monumental Requiem. Beginning in 1943, Schaechter led over a dozen performances of this epic work, the ranks of his choir often depleted by transports to Auschwitz. Schaechter himself was placed on one of the trains in October of 1944, and he perished on a death march the following year. The conductor’s remarkable story is at the center of “Defiant Requiem: Voices of Resistance,” a new film airing Sunday night on PBS stations in honor of Holocaust Remembrance Day. 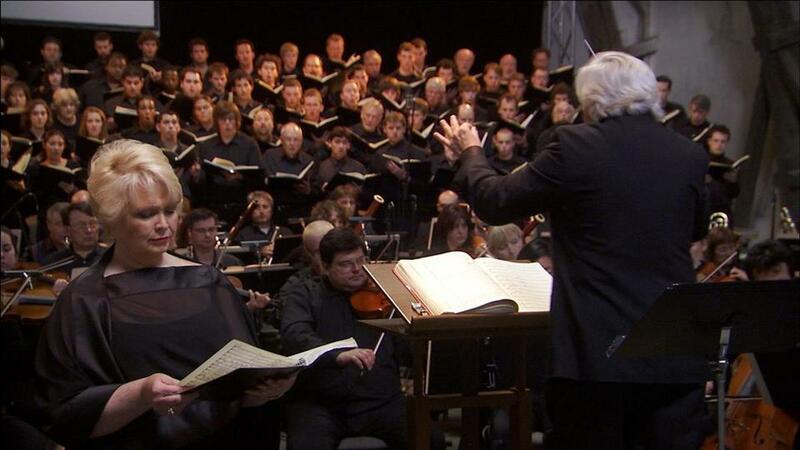 Also at its center is the staging of a modern-day tribute to Schaechter by the conductor Murry Sidlin, who in 2006 assembled a full chorus and orchestra at Terezin for a memorial performance of the Requiem. Schaechter’s name is probably better known in Boston than in most other places, thanks to the local presence of the Terezin Music Foundation, and its important work with the Boston-based survivor Edgar Krasa, who lived in the Terezin barracks with Schaechter, sang in his chorus, and figures prominently in this film. But “Defiant Requiem” will now allow Schaechter’s story to reach a much wider national audience. 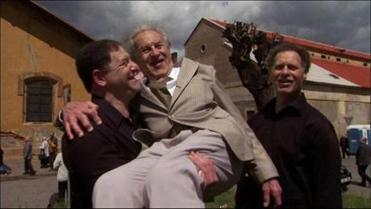 Boston-based Holocaust survivor Edgar Krasa and his sons, Raphael and Daniel. In its dramatic approach and in its narration (read by Bebe Neuwirth), the film seems geared toward that broader viewership, assuming little previous knowledge of the period. After introducing the camp and life at Terezin, the narrative swings back and forth between Schaechter’s Requiem and Sidlin’s Requiem, which is to say, between history and memorialization. Commentary from Krasa and several other survivors who sang in Schaechter’s chorus provide some of the film’s most moving moments, as the participants recount what it meant to make music in a place of such darkness, and through their singing to reclaim a modicum of human dignity. Krasa also speaks about how the text of the Requiem itself took on new meaning for the inmate chorus, with the famous “Libera me” becoming not a plea for divine deliverance, but rather — quite literally — for liberation. Schaechter himself apparently maintained a quixotic hope that his singers’ fervor might puncture the façade of the model city the Nazis cynically erected to deceive an International Red Cross delegation that visited in 1944. Tragically, it did not do so, and that performance, with both Red Cross and Nazi officials in the audience, was the choir’s last. 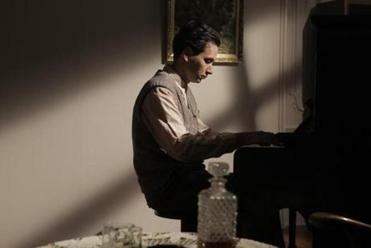 A reenactment of Rafael Schaechter at the piano. Writer-director Doug Shultz’s choice to mostly exclude professional historians from the film’s roster of talking heads makes it feel less like a documentary and more like a sincere commemorative tribute. Emotional excerpts from Sidlin’s 2006 rehearsals and performance of the Requiem help underscore this point. Even so, the educational potential of “Defiant Requiem” is palpable. That said, for viewers already acquainted with the broader subject, I couldn’t help but wonder whether the film’s evident attempt to wring every ounce of drama and pathos from Schae­chter’s story — through the tone of the narration, the use of animation, and even speculative re-enactments — ultimately leave enough room for the native power of the material to fully surface. The most effective memorials, after all, put us in mind of a tragedy but also surround it with a kind of negative space through which one might begin to register the dimensions of the void.